The Rolling Stones are an English rock band formed in London in 1962. 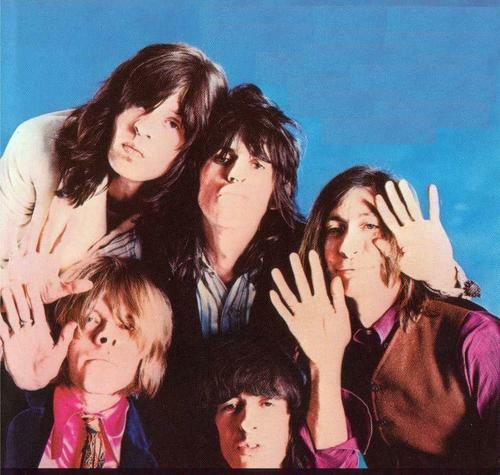 The first settled line-up consisted of Brian Jones (guitar, harmonica), Ian Stewart (piano), Mick Jagger (lead vocals, harmonica), Keith Richards(guitar), Bill Wyman (bass), and Charlie Watts (drums). Stewart was removed from the official line-up in 1963 but continued as occasional pianist until his death in 1985. Jones departed the band less than a month prior to his death in 1969, having already been replaced by Mick Taylor, who remained until 1975. Subsequently, Ronnie Wood has been on guitar in tandem with Richards. Following Wyman's departure in 1993, Darryl Jones has been the main bassist. Other notable keyboardists for the band have included Nicky Hopkins, active from 1967 to 1982; Billy Preston through the mid 1970s (most prominent on Black and Blue); and Chuck Leavell, active since 1982. The band was first led by Jones, but after teaming as the band's songwriters, Jagger and Richards assumed de facto leadership.